No Project too big or too small. Here's just a small sampling of the swimming pools and spas we've helped preserve over the years. City of red bluff Mcglynn pool - 13,000 sq. ft! McGlynn Pool is a busy year-round recreational facility in central Red Bluff, California. The pool has a gleaming, hardwearing Advanced-Glass surface that will serve the community well into the future. This wasn’t always the case though. A few years ago this poured concrete pool had significant structural cracks and was leaking in several areas, including in the overflow gutters of the pool. It had been painted many times in attempts to extend its life but these Band-Aid fixes were no longer cutting it. City officials knew a significant repair was definitely in order, and bond money was finally secured for a complete pool renovation. They originally considered re-plastering but their engineer rightly advised them that the plaster surface would just crack along the joints in the pool and also over the existing structural cracks. So they turned to fiberglass, sending the job out to bid a couple times. A pool in this condition is not easy to resurface - surface preparation alone posed some real challenges. The old pool had many layers of paint and the substrate was extremely rough and cracked. Also, the size of this pool required a skilled team and a company with the project management experience to see the project through to completion successfully. Advanced Pool Coatings was the only company confident enough to bid on the job. The McGlynn Pool experience shows us for who we are: the best fiberglass company in terms of work quality, work ethic, project management experience, and work relationships. Simply put, we love to solve our customer’s pool problems and provide beautiful, lasting solutions! Advanced-Glass is a rigorously tested, six-stage fiberglass application method that produces the most durable pool surface in the industry. Please contact Advanced Pool Coatings for more information about the Advanced-Glass difference. 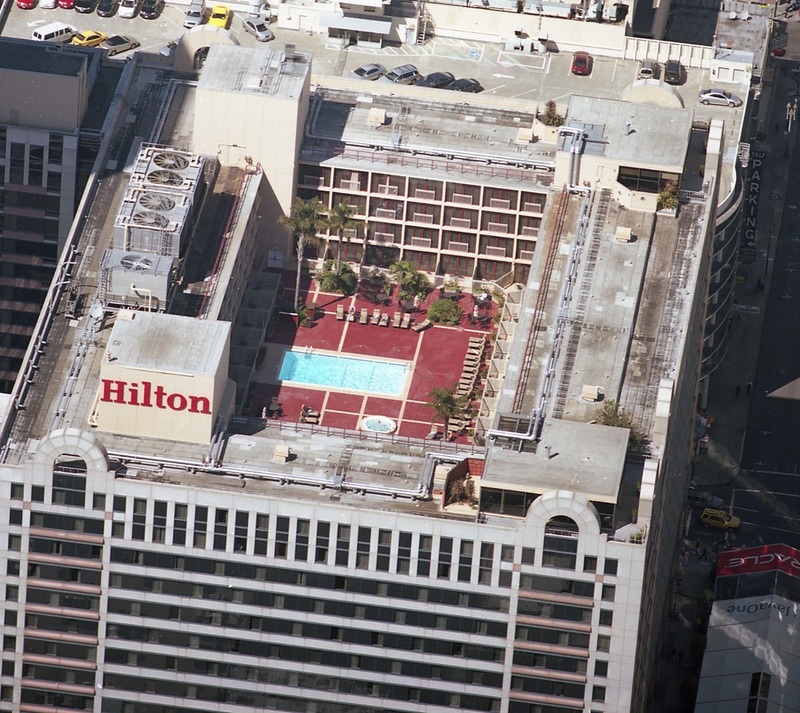 Located on the roof of the 16th floor, Hilton's San Francisco swimming pool needed major renovation. For their pool remodel project, they selected Advanced Pool Coatings for our fiberglass pool resurfacing expertise, as well as our expert tile and coping installation. Any project in the bustling city of San Francisco poses logistical challenges, so it takes real professionals with project management experience to successfully complete a project as complex as this! When Knott's Berry Farm needed fiberglass and gel-coat work on their log ride flumes, they knew where to turn. Advanced Pool Coatings specializes in the repair and resurfacing of fiberglass pools, spas, commercial waterslides and water features. Read more about our work with Knott's.